Commonly known as Tuberoses, these amazingly sweet-scented beauties will enchant you in summer, as their beautiful fragrance wafts gently on warm evening breezes. You can see why it is used so much as a base fragrance in leading perfumes !! Tuberoses make a really nice cut flower to scent a room with, or enjoy in pots too. Plant the bulbs indoors in spring to get a head start, and bring outside from May, growing in a warm, sunny spot. They flower in August and September, producing pretty creamy white double flowers, with an intoxicating strong fragrance, on stems about 60-80cm tall. Top tip for success is once flowered, remove this section of the bulbs, as it never flowers again, but leaving new side shoots to flower next year. Bring pots inside each winter for frost-free area, and dry back. 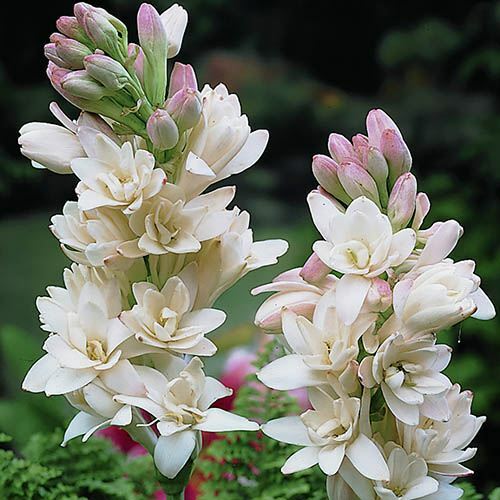 Enjoy the allure of your own Tuberose fragrances wafting on evening breeze in your garden. Supplied as a pack of 10 bulbs, ready to plant. Size 12/14. Will flower this summer. Tuberose thrives in hot afternoon sun but remember to keep the soil consistently moist before and during flowering to ensure the best blooms. Your Tuberose will grow best in fertile, free-draining soil, so dig in plenty of organic matter before planting. Plant tuberose bulbs in spring when all danger of frost is past. Place the tubers 5-10cm (2 - 4 in) deep in well-draining soil in a sunny spot. If planting up into a pot, choose one with a wide, stable base as flower stems can reach up to 1m and you don't want it toppling over! Good drainage is absolutely essential, so ensure that the pot has generous drainage holes. During the growing season, keep plants well-watered. Plants are not hardy, so in order to overwinter tuberose for next spring, you will need to lift the tubers if you have grown them in the border. Wait until the foliage has yellowed and died down and then, after digging them up, remove excess soil, cut off the dead leaves, and leave them air dry for a week or two before storing in a frost-free place. If grown in pots, dry them at the end of summer when leaves begin to die down, overwinter in a frost-free place and then recommence watering and feeding in spring.